As sad as it may seem, when I see a coffee with an Italian name, I become slightly trepidatious of its quality. That's not because I hate Italian coffee; it's simply that all of the Italian coffee I've crossed has been either massively over-roasted or extremely stale (too many poor roasters trying to cash in on the rich and reputable coffee history of Italy). 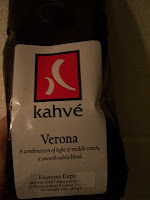 Thus, I freely admit that when I received a pound of Kahve Koffee's Verona Blend (I assumed named for the northern Italian city of old) I almost rolled my eyes. Opening the bag displayed a mixed coffee blend of medium to medium-dark roasts (the website spouts that it mixed light and medium roasts). But my infusions of drip, french press and siphon disintegrated some of my concerns. The french press did produce a bit of a darkness but it held a lot of complexity. There was bits of granola, peanut butter, light cocoa, garlic pepper and an overall sweetness. The darkness seemed to favor the front, the nuttiness the middle and the sweetness on the end. The drip produced a cup that had a combination of tastes more similar to Dr. Pepper. The coffee was a little less dark and held tinges of granola, cocoa and garlic pepper. The sweetness was a bit stronger here and overall, this brew was much smoother. The siphon was akin to the drip, similar in its Dr. Pepper taste and its facets of cocoa and nuttiness. There was some vanilla here and though the darkness was still present, it seemed to move to the back and display more subtlety. Kahve's Verona overall made a good impression but the bitterness plus a mediocre quality made this coffee only so-so. Thus, I wouldn't go as far as to say that Kahve has reconciled my skepticism of Italian-named coffee blends, but its helped me on the road of hope (note that I have nothing against good Italian coffee...just the bad stuff bringing down Italy). 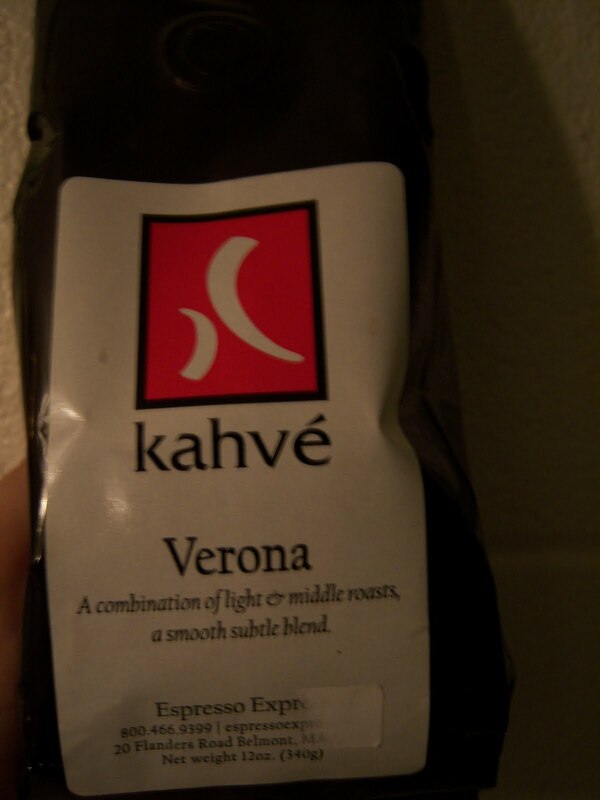 If you are on the lookout for a decent Italian-dubbed coffee blend, sample Kahve Koffee's Verona Blend. I agree that finding good coffee is not an easy task. Many micro roasters are in competition and are now trying to out best each other with better tasting coffee. And the only way to do that is to provide superior coffee that is both fresh and of good quality. Its a win for discriminating coffee drinkers!